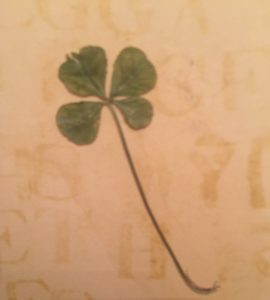 My daughter Liana found this four-leaf clover last spring. It was a quiet morning, the start of what was to be an unscheduled day for me. Ahhh. In the previous two weeks, my family and I had flown back from our family reunion in California… I had finished up an accelerated summer education course… I had had a routine screening colonoscopy… I had taken my girls to various annual appointments, gatherings with friends, back-to-school shopping, and their school open houses to meet their new teachers. 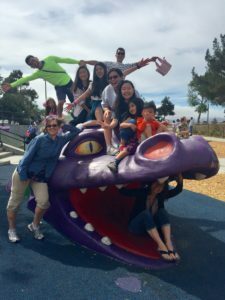 Having a great time with family in CA! That’s me in the dragon’s mouth. I was planning to head out that afternoon to indulge in some writing which had taken a backseat during the spring and summer to teaching recertification. I would hide out at the library or a café… and escape from life for a while. The door bell rang. A friend of my daughter Liana had arrived to pick up Liana so that they could go for haircuts. (Suddenly, over the summer, several of Liana’s friends had attained their driver’s licenses. And they were willing and, dare I say, eager to chauffeur. Yay!). I rushed to get dressed, greet her friend, and say, “Bye and have fun.” What happened next happened so quickly that I’m not sure exactly how it happened. All I can say definitively is that I ruptured a tendon in my left pinky. As I was getting dressed. Yes, I hurt myself getting dressed. More specifically, as I was yanking up my jeans. I heard “SNAP” and… I’ll spare you the details of what it looked like. Ouch. I know it sounds crazy, and almost two weeks later, I’m still shaking my head. And laughing about it. Kind of. My husband, Rob, rushed me to the nearby urgent care center owned by one of the local hospital systems. The nurse joked with me that I must have been doing something heroic. Ha! I had x-rays taken and my pinky was put in a temporary splint. Good news! The tendon hadn’t pulled off any bone. But! I would need surgery. Bummer. I was given a referral to an orthopedic doctor with directions to call on Monday morning. I iced and elevated. 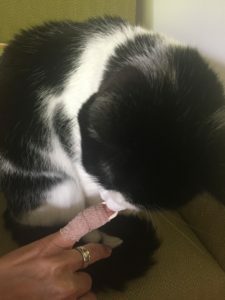 And continued on with life, disturbed that I could hurt myself getting dressed and sad whenever I peeked at my limp pinky in the splint. Every now and then, I fantasized that it would bounce back to life and not require surgery. All the while, though, I felt grateful that it wasn’t worse, that I had family at home to help me, and that we have good health insurance (while feeling very acutely that everyone deserves good health insurance). I contacted a friend who had had a hand injury last year, inquiring where she had been referred to and cared for. She raved about the UVA Hand Center (where I had not been referred to) saying that her child had also received excellent care there. Having great trust in my friend’s judgment, I decided to make the call there, first thing on Monday morning. I’d come in fully expecting to schedule surgery. Instead I felt like I’d won the lottery. Who knows? Maybe I’ll need surgery in the end. But I’m going with this until we know more. And I’ll be keeping my fingers, umm, crossed. I’m under doctor’s orders to air out my pinky for 15-30 minutes every day. Since I have to support it with my other hand, I can’t be my usual self during that time, i.e. either buzzing around doing stuff or sitting still reading and writing. So I’m doing something I’ve barely made time for since my kids were born: watching TV. Rob got a big flat-screen TV ten years ago and I barely know how to work the thing. So, there we are, Rob and I, watching a half-hour of TV together each evening. Often it turns into an hour. I’ve laughed a lot. And I wonder why I hadn’t joined him in front of the TV sooner. I like to think it’s just what the doctor ordered. While I grew more skilled at washing the dishes and my hair with one hand covered in a plastic bag, my girls started their new school year learning algebra and trigonometry. They came home with stories to tell and I felt grateful to be a recipient. Oh no. This fridge was 14 or 15 years old. It had been a tad too tall to fit underneath the cabinets, and the delivery guy (with our OK) sawed off the bottom part of the cabinet frame so that it would fit. About 10 years, the crushed ice function had stopped working. More recently, the filtered water had stopped working. And it had started making strange sounds. We had just needed to replace the entire heat pump a few months before. The stove, dishwasher, clothes washer, and dryer were all older than the fridge. Don’t go, fridge! Not yet! 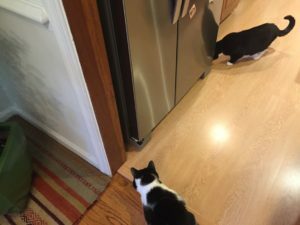 I left the kitchen table and crept toward the fridge, not wanting to face reality. On the way, I peered into the ice cream tub, and the ice cream resembled soft-serve. I reached into the freezer, touched the chicken, and it sprang back. Water was dripping from the ice container, dribbling down the walls of the freezer and onto the kitchen floor. And yet for the second time since Saturday, I hoped against hope. Maybe it wasn’t really completely broken. Maybe we wouldn’t have to deal with another bill, another inconvenience, another thing to do. I remembered that our neighbors had a deep freezer in their garage. I called them. Even better! They had replaced their fridge recently and moved their old one into the garage. It was working and nearly empty! They welcomed us to use it. We packed up everything except for essentials for the next day’s breakfast and lunch. Rob and Liana brought over the food to our kind neighbors. Then Rob went out to get Ready Ice for the freezer where we then stored the essentials. Leaving four dishtowels on the floor in front of the fridge to sop up the dribbling water, I spent the better part of Thursday shopping for a fridge that would fit our smaller space. At Lowe’s there was one more in stock! On sale! To be delivered on Sunday! Score! We knew we would survive with our food just down the cul-de-sac road. And we marveled at how people in our world live without a fridge and other privileges that many of us take for granted. I ran down to the kitchen and threw open the freezer door (careful to protect my pinky, of course). It was working! I threw open the fridge door. Working, too! No more water dribbling out of the freezer. Maybe a mechanical part had gotten clogged with ice, shutting down the machine until the water had drained? I really had/have no idea. There’s a reason I stick to books. I voiced the possibility of canceling the new fridge, but the other three people in my house vetoed that right away. Yeah, it had become too flaky. Sometimes it’s best to let things go. And we were lucky that we could afford to let this one go. Bye, fridge. Thanks for all the years! Later that day I was headed home at the start of rush hour. First, I planned to make quick stops at the library and supermarket. The cars were going the usual 60 mph on this stretch of a two-lane highway. I was traveling in the right lane, preparing to exit soon, when I noticed that a line of stopped cars had suddenly started to form. Maybe an accident? Or an overflow of exiting cars? The-car-in-front-of-me stopped. I stopped. I looked in my rearview mirror. The-car-behind-me stopped. But the-car-two-cars-behind-me DID! NOT! STOP! It was coming. I would be rear-ended. But wait. Where was the second “CRASH!”? You know, my car? My car hadn’t budged from the impending impact of the-car-behind-me. Why hadn’t my car been jolted? And then I saw the-car-behind-me fly to my left-hand side and stop beyond me in my lane. And then I saw the-car-two-cars-behind-me fly between our two cars and continue beyond the-car-behind-me. I pulled over to the break-down lane and looked around, trying to process what had just happened during the last few seconds. The-car-behind-me was smashed in the rear and in the front. The-car-in-front-of-me had sustained less damage, but still, it had been hit and was further up in the right lane than the-car-behind-me. The-car-two-cars-behind-me was behind the-car-in-front-of-me, but in the break-down lane. So, the-car-two-cars-behind-me had hit the-car-behind-me AND the-car-in-front-of-me. And my car was untouched. Untouched. I took a photo (which I’m not posting to protect the privacy of the other drivers), then got out of my car. Everyone said they were OK. Thank Goodness. A police officer came quickly. Traffic started to move in the left lane. Each driver talked to the police officer. I was free to go and got into my car. The police officer waved me forward, my car tires crunching pieces of the other cars that were all much newer and nicer than my 17-year-old car. As I drove, I replayed the scene in my head over and over, trying to make sense of this accident that happened all around me but had left my car (and most importantly, my body) unharmed. After the-car-two-cars-behind-me hit the-car-behind-me in the rear, the-car-behind-me steered into the left lane, presumably to avoid hitting my car, and then steered back into the right lane. The-car-two-cars-behind-me steered between the-car-behind-me and my car, presumably to avoid hitting either one of our cars. However, because it was traveling so fast, the-car-two-cars-behind-me hit the-car-behind-me again, this time in the front; and then went on to hit the-car-in-front-of-me. I could not believe how lucky I was to be able to go on with my day. If my pinky had been like winning the lottery, this was like winning countless lotteries. I made it to the library ten minutes before closing to drop off some books and take some books off of hold. I picked up a few groceries for dinner at the supermarket and headed home. Rob met me at the door. I said, “I was almost in a bad car accident.” That, of course, made no sense. So he said, “What?” And I explained, feeling ever so grateful. And wishing the very best for the drivers and passengers of those three cars. The weekend had been uneventful, thankfully. And then the highlight arrived on Sunday afternoon: the new fridge. For the past six days, we’ve been enjoying crushed ice and filtered water. We love our new fridge. Well, everyone except for the cats who are wary of it. Maybe it looks like a gigantic animal. It certainly looks and sounds different. And probably smells different, too. 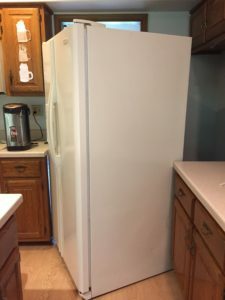 But unlike the pinky that needed surgery, the fridge that had drawn its final breath, and the car accident that was bound to happen, this new fridge is indeed what is seems to be. What did I take away from that week? Be mindful; stay in the moment. I’m trying to use my pinky as a wake-up call. When I’m getting dressed, let that be what I’m focusing on instead of thinking about a zillion other things that may distract me… Or maybe I’ll just stay in my pajamas the next time the doorbell rings. Be kind. I interacted with a number of people, mostly strangers, as I dealt with these three situations. I was met with way more kindness than not, and every bit of it mattered. I would go into things more, but this is already a super long post! Thanks for making it this far. Be hopeful. Like the saying goes, it ain’t over ’til it’s over. There is always hope. Have a wonderful Labor Day weekend! Whether you’re traveling far or staying close to home, safe travels to you and yours. And everyone. I was a kid who wrote in a diary...who grew into an adult who blogs and writes picture books. I look for the hope in any story, real or imagined. Please join me on the journey. I'll blog as inspiration strikes and time allows. New posts will be delivered to your email box. I'll never share your email address with anyone. Social Media: To Show Up Or Not Show Up? What’s on Your Shopping List? How About Some… Inspiration? Site designed by Ashley Parkin. Copyright © 2019 Amy Lee-Tai. Powered by WordPress. Theme: Accelerate by ThemeGrill.